Q: How can I save my search results in the library catalog? Open the library catalog by selecting the Books tab on the library homepage. Search for your desired topic. Log into your library account by selecting the Sign In button at the top right of the catalog page. See this FAQ for more information on logging into your library account. 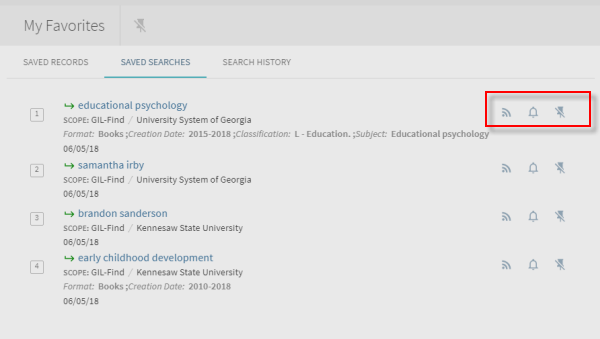 You can make the search as specific as you want to by using the "Tweak Your Results" column on the left side of the page. After you have completed the search you wish to save, click the pushpin icon that says "Save query" at the top of the search results list. To get back to your saved searches, click the pushpin icon at the top of the page. On your favorites page, click "Saved Searches" to find a list of all the searches you have saved. To open the search again, click on the title of the search. To get email alerts when new items are added to the library catalog, click the bell icon (labeled "Set an alert for this search"). To remove the search from your favorites, click the icon of a pushpin with a line through it (labeled "Unpin this search").